I’ve always thought that Rails’s “Deploy” page is one of the weakest parts of the Rails website – it’s just a bunch of links with no explanation unlike, say, the Active Job guide. Online tutorials also don’t help, most of them rely only on Heroku (which recently changed the behavior of their free tier to require 6 hours of sleep per day). Buy a book like Agile Web Development With Rails 4 or Rails 4 in Action which have chapters on deployment. Read through the docs of the links on the “Deploy” page and do everything by trial and error. Scour through the countless tutorials online and hope the one you’re working on is correct. In short, newbies are pretty much screwed. So I decided to give my own take on the “Ruby deployment for Dummies”. Unlike your usual tutorial, I wouldn’t just focus on the “How to” but also the “Why”. I’ll also look at the various alternatives for the different components of your Ruby server. 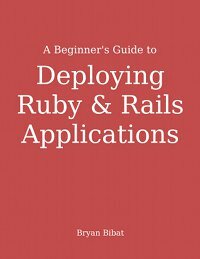 And here’s the first draft/installment: A Beginner’s Guide to Deploying Rails. It’s only the first part so it’s free to read and download. I expect to finish this book by late August.